When it comes to printing, Honeywell offers an extensive portfolio. 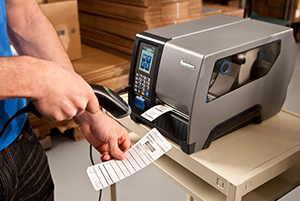 The focus lies on the development and production of thermal label printers. The range in this segment spans from compact and robust desktop printers for versatile work areas to a number of mid-range series up to heavyweight industrial printers for large quantities and uncompromising performance. Supplementing these are numerous series of robust mobile printers for various media. They offer a very large selection of printers for labels and receipts. In order to achieve optimal printer performance, Honeywell offers the corresponding consumables for every model.